This probably could be in originality section. How the cowls are painted on Z-striped cars is often discussed. So here's some pics. The green one is not my Z, but it's really close. Mine has a bit more white on the driver's side, but it clearly fades away to the green underneath just like this car. They really didn't want the orange everywhere on the NOR pacers so they were masked off. I've seen LOS pacers with coverage all over the top of the cowl. great pics on that yellow car. Looks like a gloss black on the cowl, and then goes to more of a flat on the firewall. Feel free to add more pics to this thread. That is the intent. 1969 RS Z/28 Hugger Orange (72 72) Norwood, 2B production. See a lot of white striped painted cars, but are black striped cars even painted considering the cowl is black? Just curious. My Silver with black stripes don't seem to have ANY over spray in the wiper motor well area, under the cowl panel. I can't say much for what the past owners of my car did, but the wiper area is untouched. Yes the black stripe cars are painted in this manor as well. I can't speak for all because different times of the year and different plants, but I can tell you for certain mine is this way and is unrestored. 12D Norwood and the top of my cowl definitely has gloss black sprayed on the top of the cowl and it quickly fades to a flatter black as it transitions to the firewall. It's much harder to see but as I'm carefully cleaning this car it became apparent there are 2 different blacks there. 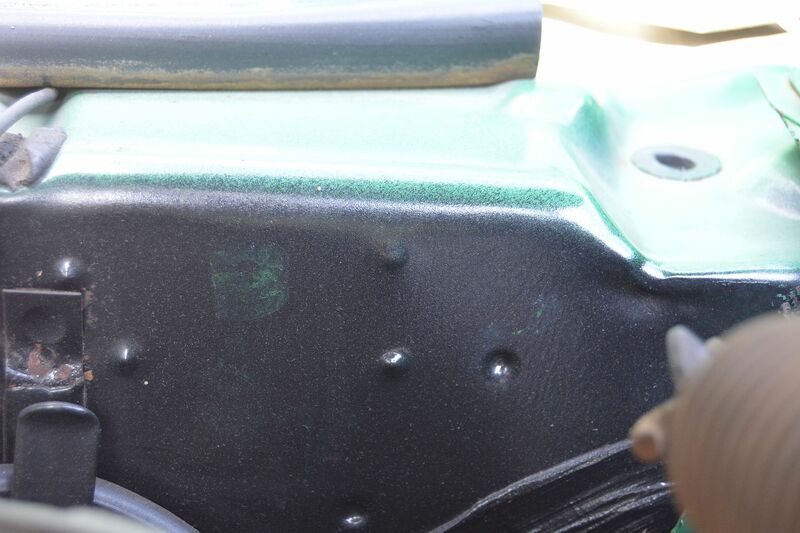 I would imagine restored black stripe cars probably don't even bother with this little detail so you won't see many done this way (shucks even white stripe cars aren't done this way on most restorations that I see). I will duplicate this however just as I see it on mine. Very easy to fade it in being black and black, and will likely go unnoticed by most people. Edit: If it helps verify, I just noticed the very first picture that Kurt put in the first post. You can clearly see the gloss black on top of the cowl that fades to the flatter black, on a black stripe car. Much later car than mine but appears to be very close to the same. However mine has much better coverage of the black as I can see no frost green showing through anywhere on the cowl or firewall area. Guess they were much more generous with the blackout that day on my car. Do you have any orange showing through like some of them I'm seeing? Mine has excellent black coverage with no frost green bleeding through anywhere. Okay, you're up under the cowl. I haven't removed my cowl yet. I was more referring to the area where the cowl transitions to the firewall. I see a lot of poor coverage of black in that area on some cars where the body color is bleeding through. Looking at that picture, I see yours is generously covered with black just like mine. Weird how our cars are so far apart yet built similar. Another interesting note. I see green "PTB" on the driver side of your firewall. My car was done in Orange but only on the passenger side. I see remnants of it, that's it. I have found nothing on the driver side at all. My car only had the PTB stamps on the drivers side, in green... and actually there's a 'second' T faintly below the trim tag... like the fella did it.. and then said.. 'I believe I can do it better!).. They were more likely to have been worn or rubbed off on the pass side, due to not being behind the master, Gary, I can't explain yours. It was an ink and not paint so it didn't take much to rub it off. I've owned the car since 1976, and never noticed the existence of the stamp marks until 2 or 3 yrs ago, and after reading JohnZ's believable explanation of what they meant, I checked and found what I found. It was more recent than that, after removing my Booster/MC for rebuild that I found a faint '2nd' T mark below the cowl tag. As far as explanation, I'm not sure what you mean unless its why they aren't on both sides on all cars? I suspect that situation is due to having a single person doing that inspection in the Fisher plant, rather than one on each side of the car. I cannot comment on the both side of cowl stamp. I only have found one set on the LH side (Yes, a Dec. car). Someone got a little creative with my stamp. Not absolutely sure on the B..it is (was) very faint. For posterity's sake. So that makes 2 December cars with only a single PTB stamp. We might be on to something then. Mine is only on the right hand side though. I see nothing at all behind or around the booster anywhere. The Silver car I posted is a 12C with stamps on both sides. I have seen many many with 2 T's on the drivers, I don't know if it was a T to check for the T trim tag and a T for Trim. I've noticed that also James with two "T's" on the drivers side and it seems one is always upside down or at least on the ones I've checked. Recently noted a 67 with the "T" under the fender drivers side which I have read is quite common. Hmm, wonder why mine isn't showing anything there. I would tend to think that stamps on the driver side would have a better chance of surviving since it's hidden out of the way behind the booster and what not. But oddly partials of mine survived on the passenger side. Is the stamp on one side not very commonly seen? I never understood why they would have 2 sets anyway but that's what I see on unrestored and restored cars. It's as if they had 2 inspectors that had to stamp the cars? Now THAT is an idea... that makes sense.. a T to verify that the trim tag is in place... (the 2nd one on mine is light and below the trim tag and I believe I've seen another one or two cars which have T stamps identical to that).. Interesting for sure Gary. I have none of that on mine. And since there are so many restored examples with stamps on both sides I tend to wonder if people are just following a trend and afraid to step outside of what is considered "normal"
Until I can find more evidence of original cars with a stamp on one side, I'm simply going to restore mine just as I see it, with PTB on the passenger side only. If at some point it's determined that there definitely should be a stamp on the driver side, then it's easy enough to go back and add it after the fact. Not a big deal. I'd like to see more 12D cars though, particularly unrestored, but unfortunately I'm told there aren't many 12D's documented here, unrestored or restored. Correction, This was bugging me so I pulled the car back down, I gave my son some super blue to give the area a little sheen, and a bright LED light and told him to look for stamps around the booster. His eye's are better than mine. I fell over when he said "yeah there is a "T" under the trim tag, and "BTP" off to the right side. It's so faint you just can't see it without assistance from artificial light and some solvent to give the area a wet look. Odd that this side didn't hold up very well while the passenger side you can see in the dark, lol. So this car is in fact much like the 12C car posted above. Well hell.. *L* I suppose I'm going to have to go inspect my passenger side a bit more closely (although I've looked pretty well before... with my old eyes)..
On the passenger side of mine it's not like others I've seen where the letters are all clumped together. My letters are spread out evenly straight across the top with about 2" between each letter. Rather neatly done. Driver side is sloppy with crooked letters clumped together. The only straight letter on that side is the T under the trim tag. if I recall JohnZ's explanation correctly, the reason both sides were stamped (typically) is that they had checkers on both sides of the car, checking the Paint, Trim, and Body... not sure if this was 3 guys or one, and that probably varied as well at different times. Maybe on your passenger side it was ONE man checking all three items, and he was a 'neatnik' (or maybe overly conscientious on his first day?).. Thanks for the explanation Gary. Makes sense. I went to the garage tonight with a high intensity flashlight and examined the passenger side on my firewall... Nuttin... no trace of any stamps ever being there even though the paint is in very good shape, whereas on the drivers side they are very legible (once I looked for them)..
Well, you two have stirred my curiosity about my stamps on my 05A Z. Up until now, I thought I had found them all, maybe not! 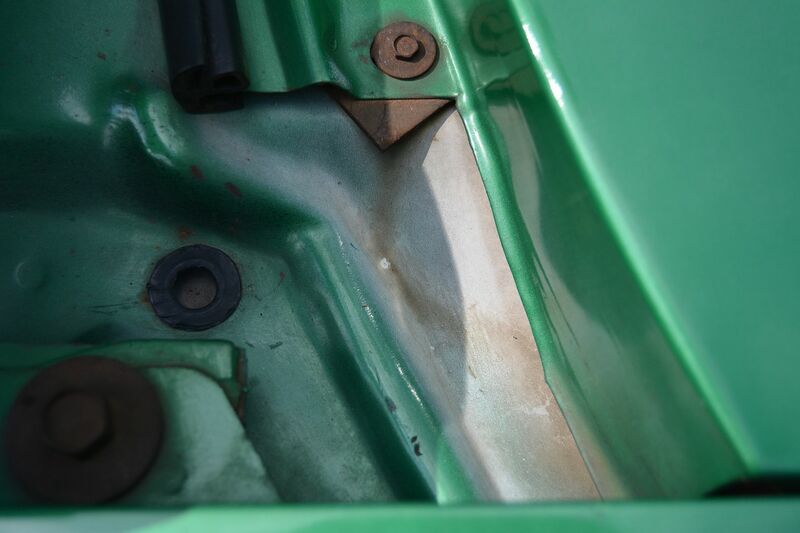 I found a green P and B behind booster and next to the harness hook , and no T. I found my T on the right side, centered above the heater core box, nearly to top of firewall. Would ya'll think my T just wound up on the right side, or I might have two sets? There are no signs of any other letters without magnification and serious light, which I will do next. Does anyone know what shift is for green, day or night? Bryan, the stamps on the right side of mine above the heater box are also right along the very top edge of the firewall just as you describe your T. Mine are very neatly placed and evenly spaced compared to most that you see. It took high intensity light and some liquid to shine things up to find them on the driver side, and I gave that job to my son, he has better eye's than me. Without any of that there is nothing visible at all, so I always assumed there was nothing there. I don't know the significance of the color change from orange and green but my first guess is the same as yours, a shift change. I cannot remember where I read, but I believe, to my understanding and memory, that green was 2nd shift, red 1st. Can someone else confirm this, please ? Hmm, seems they can't agree on the placement of the heat riser. Mine was in the downward position like shown on John's car and the AIM so that's how I'll reinstall it. If I read everything right there is only a vague mention of the shift change verses color change on the PTB stamps. Possibly orange being day shift and green being night shift or second shift. But it sounds as though that's not certain either. Would it be possible to compare components that might have been shift coded and would match up to the color of the PTB stamps for shifts. My thoughts were the G1 or G2 on the rear axle, or the A or B on the steering sector. I wold think these components were stamped at the prospective plants, but you get the idea, something that would match. I have a 07C 1968 Z28 that has a mixed bag of colors. 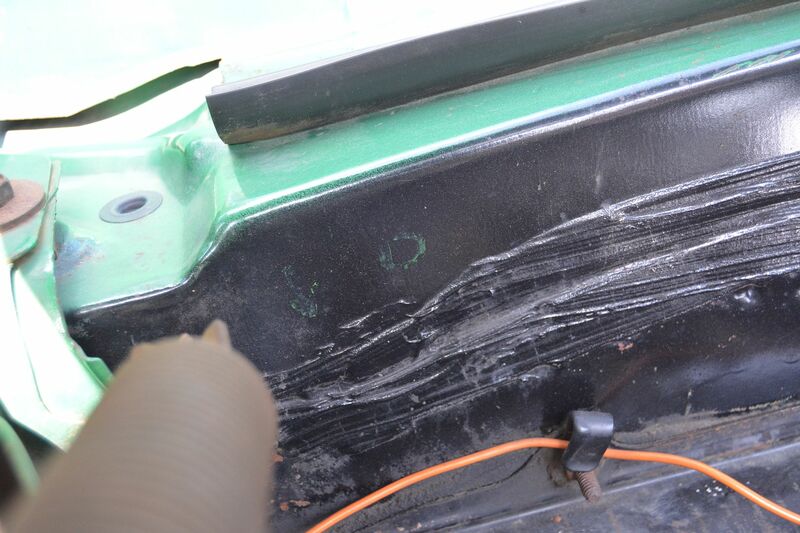 The passenger side has an orange B & P with a green T in line and spaced above the heater box. The driver side has an Orange B, P, & T to the right of the wire loom hook and then has an upright green T under the trim tag. Can't understand how the different colors would line up with shifts in this combination. Seems that if you had someone inspecting the car for the BPT that they would be doing the inspecting all at one time. Well I can see the trim tag inspection might be added at a different time than the other inspections. JohnZ had posted in a different thread on this topc (several years ago), that the only way different colors would appear on the same car would be a situation where the car did not pass a specific inspection the first pass, and had to be returned for rework or replacement of a part... made sense to me..
Now that you mentioned that scenario, I remember reading that post before. Just took a little memory jogging. Guess it didn't pass the trim test on the passenger side and had to be corrected and then run back through on the next shift. 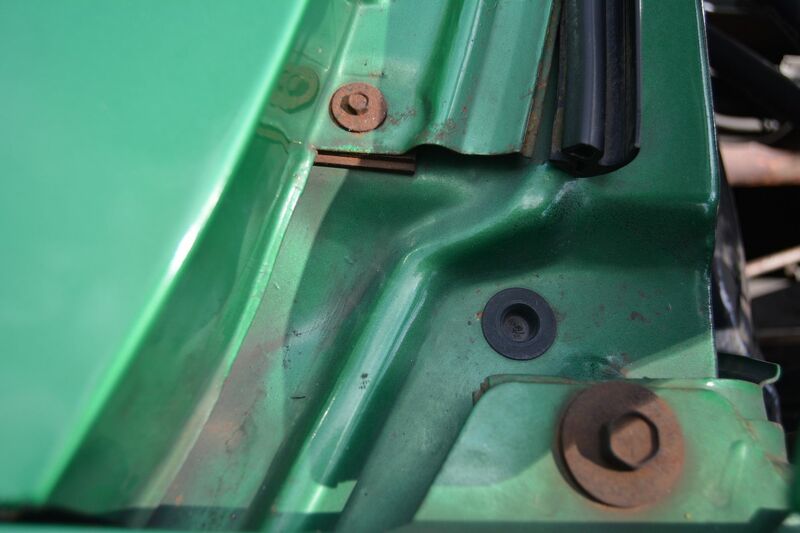 Another observation....the green T stamp on the passenger side has an anomaly on it (looks like a piece of fiber attached to the bottom that curls up half way up the upright part of the T). The green T under the trim tag also has the same anomaly.....So that seems to tell me that the trim tag stamp was probably done with the same stamp after the other PTB inspections were completed and passed. Interesting. It appears there is Ermine white mist over the firewall, the inspection marks are over the white mist correct? All great discussion & info on the PBT stampings but shouldn't this be separated into another thread for better searching in the future? Isn't the cowl paint, and how it was painted related to the PBT stamps since some of the cowl paint 'misted' down over the upper reaches of the firewall (to wit, James' post)...?? which came first? the chicken or the egg? Hi James.....The car color is Ermine white and that is the basic color showing through the fogged on firewall blackout. The firewall blackout is good up to the seam but above the seam the firewall paint seems to be rather sparse....as I said earlier it looks to be fogged on and has a rough texture. That fog goes from the heater motor area all the way over to the windshield wiper area where the black is really faint and the white really shows up well. 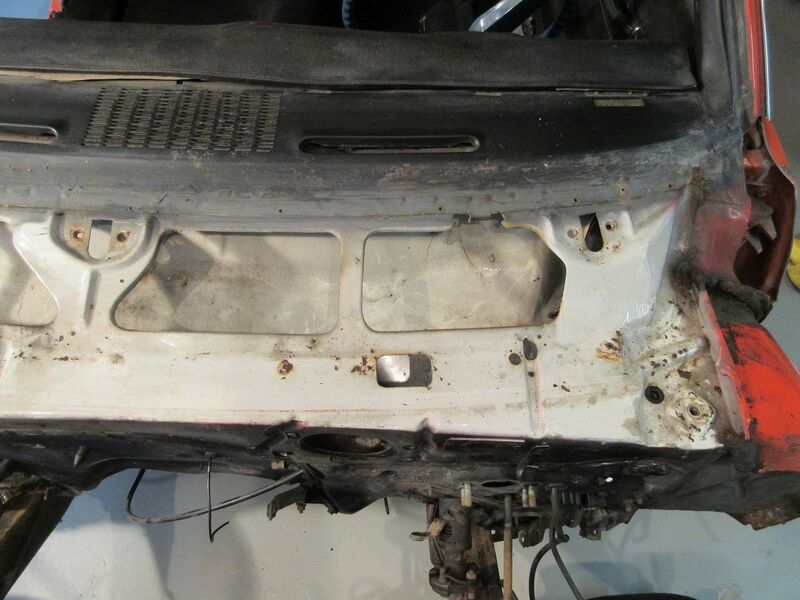 After the windshield wiper hole the firewall paint is good and solid. The cowl blackout for the stripe is solid all the way across and ends at the firewall breakover in a smooth transition. And yes, the stamp is on top of the foggy area. As stated above.....seems that in my case the mist is from the firewall blackout below and the stripe blackout is rather solid to the breakover. Don't know they got the stripe blackout transition to look that smooth. Was thinking the same thing...this has morphed into two different aspects of the same area. Has it been established when and where the cowl was painted with the stripe color? 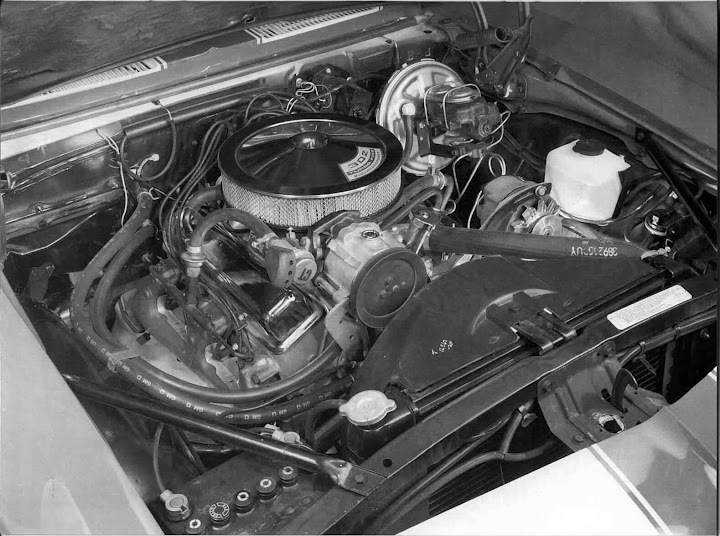 Was it done by Fisher, when the body was painted, or by Chevrolet when the front end was painted? Fisher, Chevy only painted the front fenders hood, and upper and lower valances, basically the stuff forward of the firewall, Fisher painted everything else. Just from looking at the pictures in this thread, it's hard to tell if the cowl was painted before, or after the firewall blackout. I'm assuming Fischer did the blackout. In the most recent resto of my 68Z (late 90's) the most accurate info for the cowl paint was that it was pretty much the entire cowl section that was painted stripe color. That's the way I did it, at the time. Others have said that it was masked off so that only the area under the cowl panel was painted. I have a NOR car, and the pictures of the cars here pretty much confirm that I'm in the ballpark, as far as paint coverage. 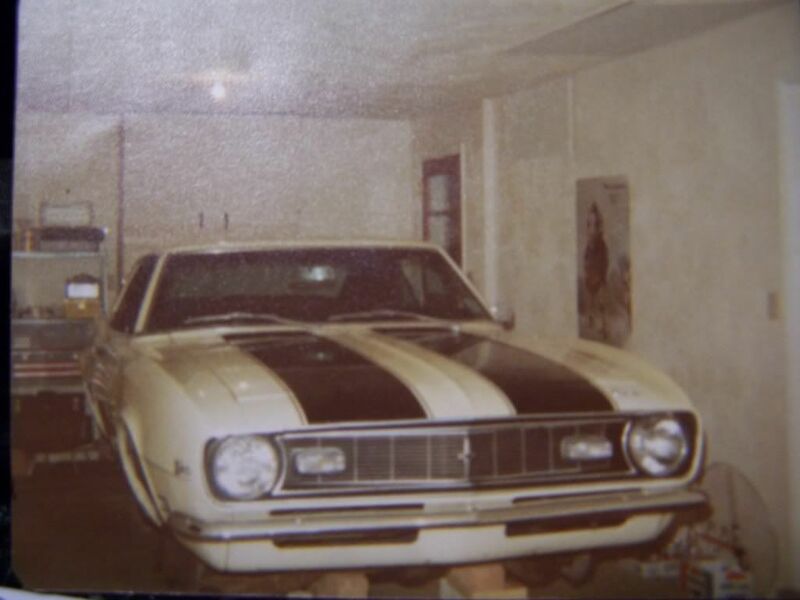 Blackout was the last painting operation on Fishers side, done after all other body color, striping, etc was completed, and it included blacking out the rocker panels and tail panel if you had a car requiring those features. Firewall black out was not performed ALL the time, I question whether it was performed 50% of the time. 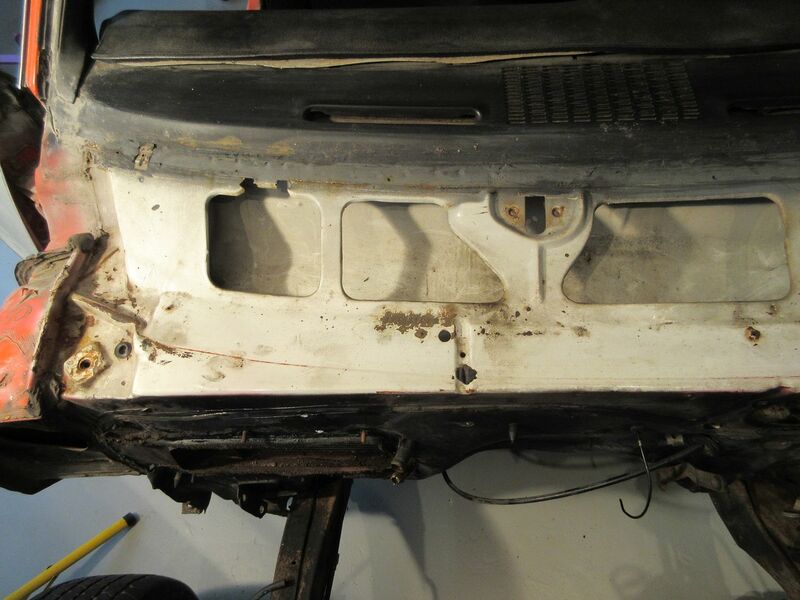 More than 50% of the unrestored cars I have observed have had a fine mist of body color on the firewall OVER whatever black was there. 03D NORWOOD Z28 Gold mist on firewall. White stripe cars are pretty neat in that respect. It's hard to see all that on a black stripe car. I'm just getting around to cleaning up the firewall on mine and there is definite gloss black on the top of the cowl that quickly fades to a semi gloss on the forward facing firewall. If there were any misting of the gloss black past the cowl to firewall transition it's almost impossible to tell. I do have a lot of frost green that shows through the firewall blackout however once you get to the tunnel transition around the bellhousing area. Left side has white paint showing but right side does not! Thanks for posting those Chick! 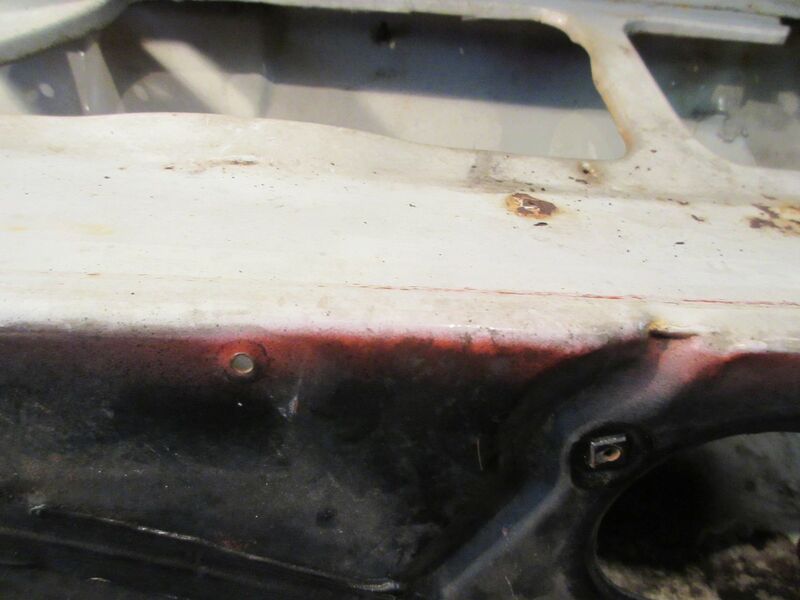 This is the best photo I could find of the teardown on my 68Z with the black cowl paint- You have to disregard the orange stripe change that someone did later in the cars life. The Gloss black in the cowl (LOS) style can be clearly seen. Here is my original cowl paint. 03D norwood. These are in a thread here somewhere but thought it would be good with the others. The black on the firewall IS NOT original. The original owner did that with a brush. I believe the dum dum on the driver side is the original also.